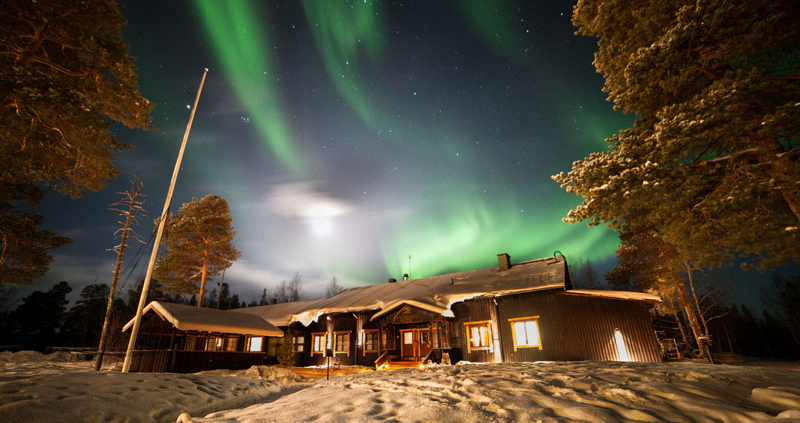 Nestled on the peaceful shores of Lake Inari and cosseted by enchanting forestry in Finnish Lapland, Nellim Wilderness Adventure Hotel is the ultimate in tranquillity and seclusion – an ideal choice for a fully-inclusive Christmas adventure. You'll have everything you need to experience a true winter wonderland, featuring a host of festive winter activities, authentic cuisine and the chance to seek the northern lights. Over 350km north of the Arctic circle, in the heart of taiga forest, the location of Nellim sets it apart with its spectacular views overlooking Lake Inari. This is pure wilderness territory, just a few kilometers from the Russian border and under an hour away from Ivalo airport. Christmas is a very magical time here, beautiful festive lights sparkling in the snow, decorations and tasty traditional food and cakes. Children can take part in baking gingerbread, decorating the Christmas tree and on Christmas Eve, the much awaited Santa will bring a small present for children and adults alike. The 4 night break includes full board at Nellim Hotel, a range of activities, use of toboggans and the traditional Finnish sauna which is available to warm up after the day's events. The remote location also provides a great opportunity to hopefully see the northern lights. There are various accommodation options to choose from at Nellim, suitable for couples to families and include hotel rooms, apartments and rustic style yet modern log suites and cabins. Please refer to Nellim Wilderness Hotel in the accommodation section for more details and ask our Sales team for availability. Child prices are valid when sharing with two adults - children may be accommodated on a sofa bed, depending on the accommodation booked. * Note: Arctic Suites have a minimum capacity requirement of 3 persons. All of our all-inclusive packages include return transfers from/to Ivalo airport; full board starting with dinner on the first day to breakfast on the departure day; accommodation in your chosen room type, winter activities as detailed below and winter clothing for the duration of your stay. The following activities are included in the 4 night package. Reindeer day by Snowmobile (approx. 5 hours) - You will receive driving and safety instructions before a short lesson and then once ready, take a snowmobile safari through the forests and over frozen lakes in the beautiful winter surroundings. You visit a reindeer farm where you will meet the herders and hear about the importance of reindeer in Lapland. Feed the reindeer and then have lunch over the open fire before heading back to the hotel. During the day you make stops at the local church and the Russian border. Aurora Snowmobiling (approx. 2.5 hours) - After driving instructions this snowmobile tour heads to the clear spots where there are higher chances of seeing the northern lights. The distance travelled will vary depending on weather conditions, and if the sky looks promising you will stop to wait for the light show. Snowshoeing (approx. 3-4 hours) - Enjoy the beautiful scenery while learning the art of snowshoeing. You will be given advice before taking to the trails up through the snowy forest and to the hills for some stunning views over Lake Inari and Nellim. A picnic lunch is included. Aurora Camp (approx. 2-3 hours) - The camp is situated on an island amidst the endless frozen ice of Lake Inari. 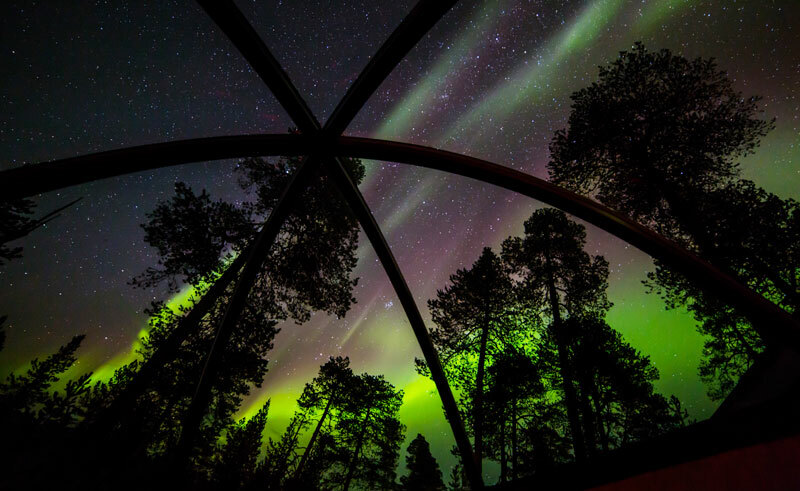 Its remote location far from light pollution makes it the perfect place to see any northern light displays. Husky Safari (approx. 3 hours) - You are given full instructions on how to handle the dog sled before heading onto the trail for a 18km husky safari on Lake Inari. The huskies pull the sled through the beautiful winter scenery, passing over Lake Inari. Afterwards lunch is served. Note the order of these activities will be confirmed locally. 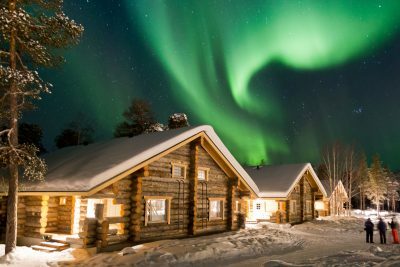 In a beautiful wilderness location in Finnish Lapland, on the shores of Lake Inari, the hotel has a warm atmosphere and offers hotel rooms, apartments, traditional log cabins and log suites. Festive family break with a private Santa visit. Fill your days with exciting snow activities, specially designed for the whole family.